The answer to the supplementary question "What accessory was sold with the Gakken to get the best out of it?" is not exactly impressive. It is this little bit of metal. Ok, the Chess King Pocket Micro De Luxe for JB and the Mini Sensory Mk II for Robert. I may have your addresses somewhere but please could you email me, just in case I send them to the wrong place. Lastly a supplementary quiz question. What accessory was sold with the Gakken to get the best out of it? Maybe a booklet to learn chess ? Or a Mercedes 500 SL (from 1992) ? They are both very sporting and joint winners as far as I'm concerned. So the Mini Sensory II is Robert's if he wants it, and JB can take his pick if the humble list contains anything he wants. Ok, I am interested in the Chess King Pocket Micro De Luxe even if it is not in working conditions. Would a Mercedes Benz Gakken be rare? an add-on to the Gakken?? I have an email from JB saying Robert is the winner, and a post from Robert saying JB is the winner !! Late 1983 did not seem to match the design or technology, lithium batteries in particular. JB also directed me to Hein's website on the question of the Gakken's year of release. Late 1983 did not seem to match the design or technology, lithium batteries in particular. Opening up the Gakken does not give any help. Well it did not for me at least. There is a clue on the machine though, which says patent pending. So I looked for a patent and came across this. The application date is 30th January 1992. So the Gakken goes down on the Timeline as 1992. Hopefully that is correct. Steve, sometimes you give the impression that you might buy a car to get a chess computer. What about an Indian Tata Nano for an Omikron Bogol 5.0? Robert was correct and the quickest but JB got the name of the model as well, as per the rules. Congratulations both, but do I cut the chess computer in half, devise a tie-break, opt for one of you or declare both winners? As for the Mercedes model I shall go for the new C-Class at the end of the 90s. Now tell me the facts Steve and I might have a Timeline year for the Gakken. dont you hate it when someone asks a question and they dont have the answer? Now this is tricky. The rules said manufacturer and name of chess computer and country of origin. 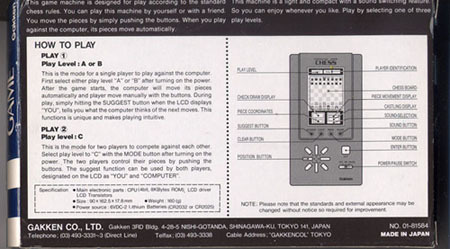 The answer is Gakken, Computer Chess Game (or Computer Game Chess), Japan. 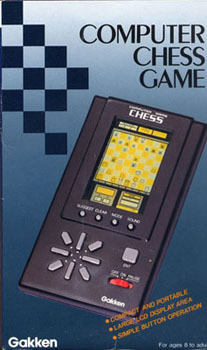 I think that it is probably the only chess computer made in Japan, though there may be some of those horrible handheld LCD games made since? Putting up a list of chess computers to chose from has been tricky, as every other one I touch at the moment seems to develop a fault. More useful may be a Novag Printer interface cable? now the real million dollar question is..
in what Mercedes Auto was the computer included as a free gift?? Name of chess computer: "Pocket Chess"
It looks like a Gakken Computer Game Chess. But there may be something else on the box, because it was distributed by different kind of companies in the world (Lansay for France). 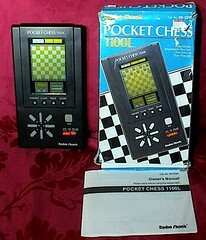 Note that it also may be a Tandy Pocket Chess 1100L (See Overtom web site). It is a while since we had a competition. Have a go with this one, there's nothing to lose. A wild guess could win. 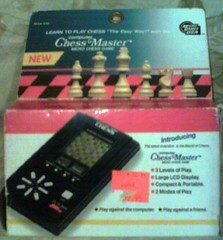 Prize: A working chess computer from the doubles I have. Delivered to your door. Rules: One guess per member, first one to correctly guess the name of the manufacturer and chess computer (not Mercedes Benz ) which is on the machine and box, plus the country of origin, wins the prize. Hmm, could be a Gakken from Japan? Rules: One guess per member, first one to correctly guess the name of the manufacturer and chess computer (not Mercedes Benz ) which is on the machine and box, plus the country of origin, wins the prize. If not won then the closest geographical guess to the country of origin wins. You must be a registered member. If not then join up it is easy. PS I will post the choice of prizes by the weekend, but there are some nice ones so get guessing.